Please note: Some products may not be in-stock and will require to be ordered. Please call store for inventory details. 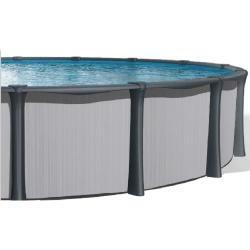 The Infinity above ground pool is designed to stand the test of time. The entire steel structure is coated with a combination of protective finishes, ensuring maximum resistance to corrosion and providing optimum durability. 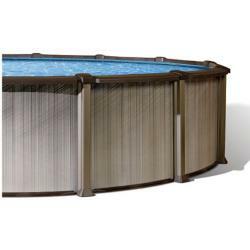 The Liberty's robust hybrid structure with steel uprights and injection-molded top ledge, resin ledge covers and foot covers, ensures you will get the most out of your pool all summer long, year after year. It's everything today's family needs in a pool! The Elixir pool introduces new textures and warm colors that redefine the norm. 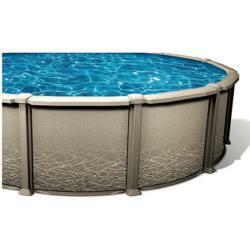 This hybrid combination of steel uprights with metallic finish and the Synflex injection molded resin top ledges, ledge and foot covers, offers this pool the highest quality in manufacturing and visual style. Available in 52" and 54" for most sizes. Let the Java's distinguished sleek looks and attractive silver grey color turn your backyard into an enchanting environment. 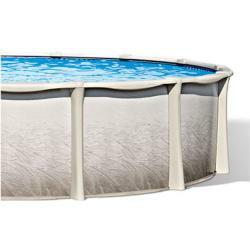 This hybrid combination of steel uprights with metallic finish and the Synflex resin injection-molded top ledges, ledge & foot covers, offers this pool the highest quality in manufacturing and visual style. 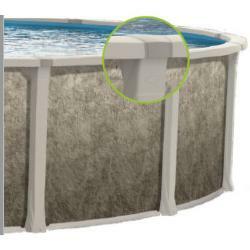 Compatible with salt water chlorinator systems, the Sonata LX is totally made of resin and sports a champagne structure and a subtle and delicate camouflage wall pattern that will make this pool look beautiful in any backyard. 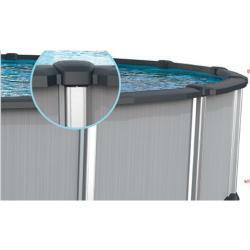 The Oceania has a resin structure that can be combined with any salt chlorination system. This concept elliminates the possible corrosion risks that come with steel-and-salt combinations. The New Anchor introduces elegant greys creating a sense of sanctuary in your backyard. The resin structure can be combined with any salt water chlorinator system. This concept elliminates the possible corrosion risks that come with steel-and-salt combinations. Let the Java's distinguished sleek looks and attractive silver brushed finish turn your backyard into an enchanting environment. 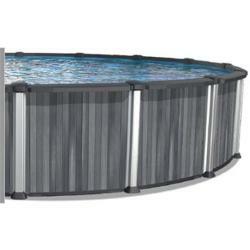 This hybrid combination of steel uprights with metallic finish and the Synflex resin injection-molded top ledges, ledge & foot covers, offers this pool the highest quality in manufacturing and visual style.